We sell more because we charge less. Let us help you in your search for the perfect RV - at a great price! Have you ever been to an RV dealership that claimed to be a "Super Store" on their website but had very little inventory on their lot? At Fun Town, you'll always have more RV's to look at than you can possibly see inside a day. We keep our website updated in real time so that everything you see here on our site is in stock at our location - available for you to purchase now or upon visiting our dealership (unless subject to a prior sale). 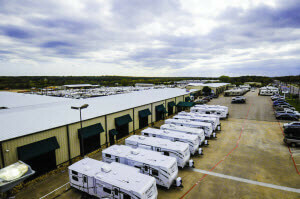 We sell A LOT of RV's and our turn ratio is 3-4 times that of the average dealer. Because our competition sits on their stock longer than we do, their per unit cost is higher and consequently, they're forced to charge more. At Fun Town we enjoy always having fresh merchandise to show. And with better inventory management, we're able to pass the savings on to our customers. Nobody Beats Our Prices, but us! We guarantee to sell any like, in stock, and comparably equipped RV in Texas for less. We make this pledge because we can back it up. Remember, nobody beats our prices but us. We've heard, over and over again, stories told by our customers about what initially seemed like a great price only to recognize it was a bad deal because the other dealer would not offer a fair amount for their existing RV. Shockingly, some dealers effectively offer zero dollars because they flat out refuse all trades. Experience has shown us that most customers are very reasonable about their trade's fair market value and we're happy to pay it. Add the significant tax credits most customers enjoy by trading and Fun Town customers save even more! The cliché "If you don't like the weather in Texas, wait 5 minutes, it will change" is so true. 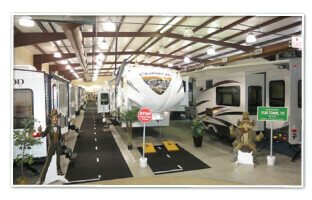 For your comfort, we offer 80 RV's inside our showrooms. You will come to know a lot more about the RV you're considering when it's plugged in, the lights are on, and you can see all of the features that come to life. So come on in out of the heat, cold or rain and shop in comfort seeing features and details that will empower you to make a better educated decision for your next camper. 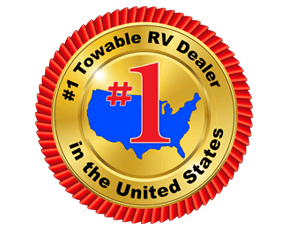 It is our great privilege to be of service to folks like you who, by choosing our company, allow us to play a small part in their efforts to create lasting memories, foster relationships and enjoy the wholesome lifestyle that an RV makes possible. Thank you for the interest you've shown in our site, our company and the employees of Fun Town who look forward to earning your business.